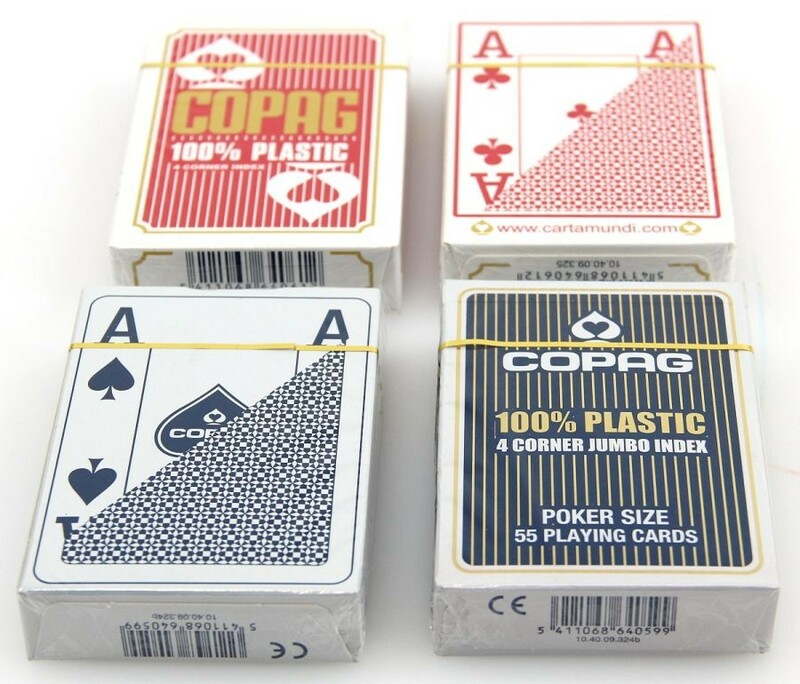 4x Copag 100 % Plastic Poker 4 Corner Jumbo Index playing cards, backsite 2x red / 2x blue. Each package 52 cards + 2 joker, intern. picture, 4 jumbo index, poker - size (88 x 63 mm). These cards are 100% Plastic - durable, washable and long lasting. Made from PVC plastic, an ultra high performing material. This high performance cards will last longer, shuffle better, and slide across the tables in such a manner that you will never want to play with anything else again. COPAG cards are resistant to bending and tearing. They will always spring back to their original shape. COPAG cards are nearly impossible to crease or mark. Therefore, you can be sure when you are playing with COPAG cards that you are in a square game. COPAG cards will not mark, dent, or crimp under normal playing conditions.